The websites I design are typically built using WordPress unless they require another solution. Although WordPress was originally created as a platform for blogging, it can also be used as a powerful Content Management System (CMS). This makes it easy for you (and your team) to update and manage your website and maintain control of the content. I can show you how to update your site, and provide a written guide to assist you. You’ll also find plenty of support available online too, should you need it. Each WordPress site is designed and custom built specifically for your needs so you can be confident it meets your requirements. All websites designed and developed by Drawn By Day Studio also integrate best-practice Search Engine Optimisation (SEO) techniques and Google Analytics. This shows you how well your site is performing and helps you plan how best to curate your website content to meet your goals. 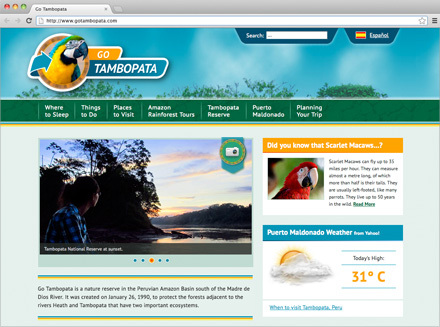 Go Tambopata, dual-language website built with WordPress. Have a look at the Web Design section to learn more about how I can help you with digital design and development, or read more about WordPress on the official site, including the requirements for web hosting.